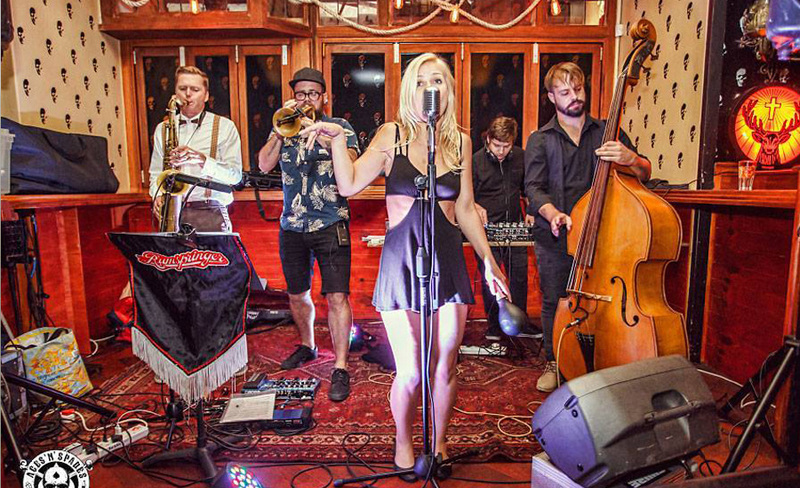 A “get-up and have-it” electro swing outfit with deep electro beats, a tinge of Balkan with a front-line holding sax, trumpet , layered with French guitar work and wild percussion. This Hot 4/5 piece consists of Carla Louw on vocals, with Lee “Lips” Thompson on Trumpet, Simon Bates on Sax and Andrew F playing the big back-beats. Performing at Weddings, Corporate functions and festivals including, Rocking the daisies, Flamjangled, The Loeries, Resonance, JB Med, Seychelles and many more. Rumspringer was conceived by “The Sunroom”….Mr Hutton and Mr Florenca, the naughty creators of Vaudeville and Renegade Bingo.